On April 3rd, 2016, Pastor Stephen Baker from Clearnote Church in Bloomington will be speaking in both services at Reformed Church of the Holy Trinity. 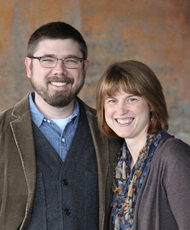 Stephen Baker has served as an associate pastor of Clearnote Church, Bloomington (CNB) since 2003. In 2001 Stephen completed a Master of Ministry degree from the Reformed Baptist Pastoral Training Institute of Worcester, Massachusetts. Stephen's responsibilities at CNB include preaching, pastoral counseling, discipling, and teaching. In addition, Stephen also serves as Dean and lead instructor at Clearnote Pastor's College. Stephen is married to Sebra, and they have six children. Reformed Church of the Holy Trinity is located at 8209 New Harmony Road in Morgan County (formerly New Harmony Methodist Church). Pastor Baker will be speaking in our 10:30 a.m. morning service and in our 1:45 p.m. afternoon service. Following the morning worship service we will be having a pitch-in dinner. All are welcome to stay and fellowship with us. For more information please contact Pastor James Brown Jr. at 912-978-0279 or email him at reformedholytrinity@gmail.com. Reformed Church of the Holy Trinity is a new church with an ancient message. We invite you to come worship with us and learn more about the reformation work here in central Indiana to reclaim our nation and all nations for Christ. We are a small congregation of about 40 people who meet in a historical rural church building constructed in 1900. Although we are very diverse in ages, for a small congregation we have a high ratio of children. We encourage family worship but we do have a place for mothers to take infants and/or small children if necessary. We come from various walks of life but we are common people who seek to know Christ and to serve Him in our various vocations and families. Some folks dress more formally and others casually but as a general rule we are fairly casual. Some women wear dresses and others wear slacks. So, no matter what your custom may be, you will feel right at home. Although every church claims to be warm and friendly, we can confidently claim that you will not find a more friendly environment than at Reformed Church of the Holy Trinity. We value fellowship and relationships and would best be described as a family of families. Our services are liturgy is arranged according to the Scriptural commands and examples. We are hymn focused but do sing modern songs. Our emphasis is not upon the era of the music but upon its Scriptural and theological content. Every week we receive the Eucharist (Lord's Supper) and invite all professing Christians to participate in the examination, thanksgiving, celebration and communion of the Sacrament. The morning service usually lasts between one hour and fifteen minutes to one hour and 30 minutes. Our service consists of the call to worship the Triune God in the Father, Son and Holy Spirit, the confession of sin, the consecration of our lives through the preaching of the Word, the communion with God and man through the substitutionary life and death of Jesus Christ, and the commission and blessing peace to go into the world to love and serve Christ. If you have never been in a Reformed church service, you will not find its components foreign from what you have experienced in evangelical churches. We sing, pray, read the Scriptures, preach the Word and observe the Sacraments. However, you will immediately notice the emphasis upon the Word of God and the progressive revelation of the gospel through our order of worship. We are reverent and joyful; formal and dynamic; academic and practical; and liturgical and relevant. Like all Christians, we believe in the Triune God, the Holy Scriptures, and the gospel of Jesus Christ. We believe in the apostolic authority of the Church that Jesus gave to His apostles and was then revealed in the New Testament epistles. What sets us apart is our whole of Scripture reliance and our historical heritage and modern application of the ancient Church creeds and the Reformed confessions of faith. We believe in the inspiration, authority and sufficiency of both the Old and New Testament. The Bible is a progressive revelation of God and His relationship to man through covenant. Therefore, we do not divide the Scripture into separate and distinct era's that are no longer applicable or relevent. Our connection to the ancient Church is seen in our profession of and use of the early Church creeds. We are not attempting to emerge the Church in new doctrines or practices but to proclaim the ancient faith that was delivered by Christ to His apostles and from His apostles to the Church. This heritage is also seen in our profession of the Reformed confessions of faith. The Great Reformation restored the Church to the ancient faith after many years of corruption and apostasy. We confess and preach these same doctrines today. What is so refreshing in this day of constant change is experiencing the stability that is found in worshiping in the same form, preaching the same doctrines and observing the same practices as the Church has for 2,000 years. We are located between Mooresville and Martinsville, located south of Waverly just off of S.R. 37. Just go east on Perry Road and we are about 2 miles from S.R. 37. Perry Road turns into New Harmony Road. You can Google 8209 New Harmony Road for directions. We hope you will come and join with us as we worship and serve the Triune God in liturgy, community and mission.